My first solo run as a truck driver has been completed, and boy do I have a story to tell. This trip was eventful, but was also successful in the end. Despite a few embarrassing details, I'm going to share it all. I can handle the razzing, and probably deserve it for a couple of things I did. I was finally assigned my very own truck at my company terminal. A yellow 2007 Freightliner Century with 270,000 miles on it. The truck is in pretty good shape, and I'm very happy with it so far. After waiting around for about a day, I was told to pick up a trailer and dead head (empty trailer) to Liberal, Kansas and wait for a load there. So, I hooked up to the trailer and off I went! My first time solo in a big truck! The trip went pretty well, but I was a nervous wreck. It is a little tough hopping into a new truck. The truck acts differently, makes different noises, handles different, and since I was already nervous, that just added to my anxiety. It was a little hard for me to relax. the more I tried to make myself relax, the more nervous I would get. Also, Kansas has a lack of expressways, so I was traveling on small two lane country roads through little towns. This is not something I was really used to and didn't have much experience with. But it went real well. I was able to get to Liberal without any problems and parked the truck for the night. Lucky for me, I found a parking spot I could simply pull into, so I didn't have to back it up. I was happy about that. The next morning, I was told to pick up a load of beef (it's what's for dinner). So, nervous as heck, I hopped in the drivers seat and went to find the customer's location. I approached a large facility that had a lot of trucks in it, but I didn't see a sign stating it was my customer. So I kept going. Turns out, I should have pulled in. That's where I was supposed to be. So now I'm stuck on this two lane country road with nowhere to turn around. After about 10 miles, I happily found a spot to safely get my truck turned around and over to the shipper. Once I arrived, they told me to take my trailer into their lot and drop it. Then I was to bobtail (no trailer) out to a parking area and wait until my load was ready. The morbid part is, I had to literally wait for the cows to be slaughtered, processed, and loaded on my trailer. Unfortunately for me, this took them about 12 hours. Unfortunately for the cows...well...you know. Finally, I was able to hook back up to my trailer and hit the road. I had two drop off points. One in a suburb of Detroit, and another in the city of Detroit. They loaded about 42,000 lbs of meat into the trailer, so it was a little heavy. I left the facility, not realizing there was a scale at their location. Not knowing this, I figured I'd just hit the first truck stop to scale out. Well, there aren't a whole lot of truck stops in Kansas, and even less that actually have a scale. So, for all I knew I was driving overweight. The miles kept ticking away, and I was getting more and more nervous about getting busted at a weigh station. I even came up to one weigh station and I think my heart stopped for about five seconds until I realized they were closed. Phew! Finally, I got to a truck stop that had a scale. Turns out, I was in fact overweight on my drives (rear tractor wheels) by about 400 lbs. So, I slid the rear tandems (trailer wheels) forward a bit to help even out the weight (for those who don't know, the trailer wheels are adjustable and can be moved forwards and backwards to even the weight distribution). I finally got it right, and my truck was evenly balanced and legal. After some much needed rest, I was back on the road. Things were going very smoothly up to this point, but that was all about to change. I got some fuel in Effingham, IL at about 1am and continued down the road. I had the cruise set to 55mph, and the radio set to my favorite XM radio station. I pretty much had the road to myself and was just enjoying the drive, finally relaxing a bit. There was some fog moving into the area which had me a little concerned, but nothing too terrible. All of the sudden, my truck began to strain, I heard the sound of rushing air, and my truck started slowing down at a pretty quick pace. I had no idea what was going on at the time, so I just mashed in the clutch, hit my emergency flashers, and pulled over to the side of the road. I finally discovered the air I was hearing was coming from my trailer brake valve and I was losing air pressure very rapidly. This in turn, set my trailer brakes while I was driving (losing air automatically sets the brakes as a safety feature). I checked all of my connections, which seemed to be OK. All the hoses were connected and nothing was cut. The only thing I could hear was an air leak coming from one of my trailer brakes. After trying to regain air pressure without success, it was clear I wasn't going anywhere. I called my Road Assist department and let them know what the problem was. They said they would send out a mechanic from the closest truck stop to try and fix my problem. Meanwhile, I was stuck on the side of the road. To make matters worse, the fog was starting to get very heavy. I set out my reflective triangles, being sure to stay well off the road until I actually placed the triangle down. I then got back into my truck, put on my seat belt, and had to wait. I felt like a sitting duck. Here I was on the side of the road at night, with dense fog moving in. I had images in my mind of another truck side swiping me or a car running under the back of my trailer. After a few minutes of sitting in the driver's seat waiting, I decided to move into the passenger seat and buckle up there instead. If I was going to get hit, it was going to be on the drivers side. So why not sit on the passenger side? After waiting about 30 minutes, I got a call on my cell phone. It was the mechanic who was supposed to come out and help fix whatever problem I was having. He said he was on a call already and his shop was about an hour from my location, so it would probably be about two hours before he could arrive. Well....that's just great. Luckily though, the fog started to lift. I got on the CB every few minutes just to warn other truckers I was on the side of the road. A lot of trucks who passed also asked on the CB if I was OK and if help was coming. I thought it was nice of them to check on me. One truck from my company actually stopped to check on me. After about two hours, the mechanic finally arrived. He seemed to know exactly what the problem was and had it fixed in about 15 minutes. For those who know a little bit about trucks, I had a brake chamber go bad on the trailer. The weird thing is I wasn't even on the brakes when it happened. But, at least it was an easy fix. I'm just glad I was able to get all the way off the road when it occurred. But for this to happen to somebody on their first run, and to somebody who was already nervous, it certainly raised the blood pressure a bit! Once my trailer was fixed, I was pretty much out of legal driving hours. Luckily I was ahead of schedule, so I could still make my appointment on time. After my break, it was back on the road. My last leg to my customer. I arrived, and was told to park my truck and then check in. I got there about midnight and had a 4am delivery time. The guard told me to wait until 4, then drive my truck around and park it into dock number 404. No problem. Right? Well, 4am came around and I saw the guard turning trucks around. So, I figured I'd go ask him if my appointment was still at 4am or not. I locked my door, got out, and headed for the guard shack. He said yes, and to go ahead and pull my truck around. OK, great! As I started walking back to my truck, that's when it hit me. Ohhhhhhh $%!!! I locked my keys in the truck!!! What do I do now?!?! I continued walking to my truck, hoping by some miracle I didn't lock the passenger side door. But unfortunately, both doors were locked with my keys and my cell phone inside. I went back to the guard shack to let him know what happened and asked if he had a "Slim Jim" or anything else to unlock a door with. He said no, and to just pull around whenever I'm able to get into my truck. I started thinking, "do I call my company?" I didn't even know the number to call since my phone was inside and I didn't have the number memorized. Plus, on my very first solo run, the last thing I wanted to do was call my company and tell them I did something so stupid. I finally found a driver who was awake, and asked if he had a metal hanger I could have. His reaction was "locked yourself out, huh?" He gave me a hanger and said "good luck." I needed it. Could This Get Much Worse? As I began bending the hanger and positioning it down between the window and the door frame, I thought to myself, "could this get much worse? I arrived four hours early for my appointment in spite of a breakdown, but am going to be late now since I did something so stupid." Just as I thought that, it started to rain. I'm not talking a little drizzle, I'm talking about full on, pouring down rain. And what did I do to deserve this??? "So I was in the parking lot the other day and saw a guy with a hanger in the door of his car. I said, 'you lock yourself out?' And he said 'Nope, just got it washed so I'm hanging it up to dry!' Here's yer sign." For some reason, I thought of this joke, and it was suddenly the funniest thing in the world to me at that moment. That is, until I got back to reality and realized the seriousness of the situation. After about 15 minutes of unsuccessful attempts to get the door open, I started contemplating trying to get a hold of my company. The last thing in the world I wanted to do. That's when I heard the most glorious sound I've ever heard...THUMP! I got it!!!! It's open!!!! I was the happiest truck driver in the world right at that moment. I quickly changed out of my soaking wet clothes, hopped in the drivers seat, and pulled around to the guard shack hoping they'd still let me in. He smiled and said "I see you finally got into your truck." I replied with "yeah, one of those days already." He then told me not to worry about it, that they know I was there early and I can still put it in a dock. Boy was I glad to hear him say that. Up until this point, I didn't have to back my truck up at all on my solo run yet. But now I'd have to. Thankfully, it was a straight back situation and was accomplished with ease. I got the truck into the door, let out a big sigh, and waited for them to unload. About an hour later, I was handed my paperwork and told to have a nice day. My first delivery as a solo driver was a success. I don't care if my trailer broke down. I don't care if I locked myself out of the truck. As far as I was concerned, the product got there safely and there was no claim filed for damage. Good enough for me. My happiness didn't last long, though. Now I needed to head into Detroit, MI. I got there near the end of rush hour and had to deal with bumper to bumper traffic. But I finally made it to the customer. I was told to back it into a dock and was greeted with something I really didn't want to see. Trucks everywhere, and a very narrow area to back into. I had trucks on both sides of my dock, and it felt like everyone was looking at me. As I began to back the truck in, I suddenly forgot everything I had learned up to that point. I was turning the wheel the wrong way, couldn't figure out where I was going, and was having one heck of a hard time. I repositioned twice, all the while knowing that people were watching me wondering what the heck I was trying to do. Finally, I got it in. I was a little sweaty and a little shaky, but it was in there! Phew! I was unloaded and handed my paperwork once again. Success!!! My first solo run is complete!!! My adventure wasn't quite over, though. I was having trouble with my APU (auxiliary power unit) and it needed to be repaired. The APU allows me to run my heat and air conditioning without idling the engine. So, I was told to take my truck over to a repair shop off of Telegraph road in Detroit. Anybody who knows Telegraph road in Detroit knows it's a very heavily traveled road. The particular area I had to go was eight lanes wide (four lanes going each direction), plus various turn lanes. I was in stop and go traffic on Telegraph when I finally located the shop. A tiny little place with barely enough room to fit my truck in their lot. Somehow, I managed to get my truck in, disconnect from the trailer, and pull into their garage. When Does The Easy Part Start? Once that was fixed, I hooked back up to the trailer and had to try and get out of that lot. The position I was in forced me to swing out wide into all four lanes of traffic. It was bumper to bumper on all four lanes. I had a wall of cars to break into. I waited patiently for about five minutes trying to get out without success. I figured I'd take matters into my own hands. If nobody was going to let me in, I was forcing my way in. I began pulling out onto the road and got very close to a couple cars. But it got the message across that I was coming out, whether they liked it or not. Finally, I got onto the road and back onto an expressway. While making my way to a truck stop, I started to laugh. I reflected back on my trip and everything I went through and just couldn't stop laughing at myself. But I did it! My load was delivered safely!! I still can't believe the government considers this an "unskilled trade." Oh yeah, anybody can do it without any training. Suuuure. After arriving at a truck stop, I decided to back it into a spot instead of pulling into one, just for the practice. Of course, I was able to back in no problem then. I went into the truck stop and bought myself a steak dinner to celebrate my first solo run, then went to sleep for about 12 hours. I was beat. This, my friends, is truck driving. This....is living. 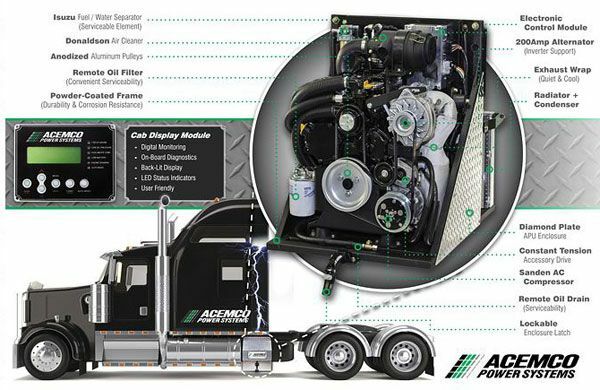 On tractor trailers, and APU is a small diesel engine that powers a heat and air conditioning unit while charging the truck's main batteries at the same time. This allows the driver to remain comfortable in the cab and have access to electric power without running the main truck engine. Having an APU helps save money in fuel costs and saves wear and tear on the main engine, though they tend to be expensive to install and maintain. Therefore only a very small percentage of the trucks on the road today come equipped with an APU. After saying goodbye to my trainer, it was time to set out on my first solo run as a truck driver, and what a humbling adventure it turned out to be!